Legendary fashion icon Michael Kors is one of our most popular tuxedo designers here at New York Bride & Groom of Raleigh. Men love the fashion forward styling and body conscious fits of his beautifully tailored suits. He has recently introduced three exciting new tux styles and, of course, we are carrying them. 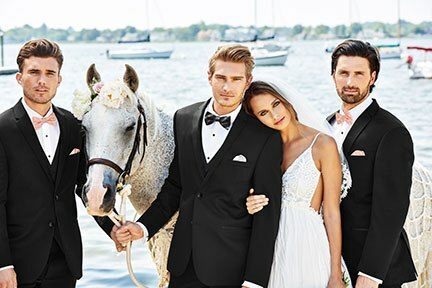 The trio of designs — Berkeley, Black Sterling Wedding Suit, and Navy Sterling Wedding Suit — are sure to be an unqualified success with dapper grooms and groomsmen alike. Here’s a closer look at each style.